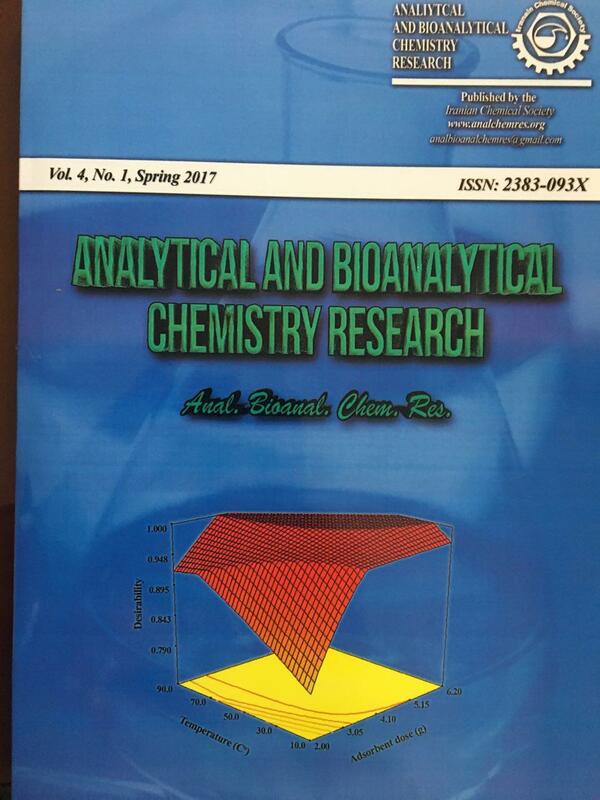 The photocatalytic degradation of two anionic azo dyes Acid Red88 (AR 88) and Acid Orange 7 (AO7) was investigated in aqueous solution using a TiO2-containing hydrogel and UV light. The pH-sensitive hydrogel poly (styrene-alt-maleic anhydride) (PSMA), was synthesized and crosslinked in the presence of melamine and TiO2 nanoparticles which results in entrapment of TiO‌2 into the melamine-grafted PSMA (M-g-PSMA) hydrogel. Potential application of this nanocomposite for removal of azo dyes from wastewater was studied and the effective parameters on degradation process including time, initial pH value of the solutions, temperature and amount of added nanocomposite were optimized. The optimized values for effective parameters are as follows: time: 30 min, initial pH of the solutions: 5.23 for AO7 and 5.3 for AR88, temperature: 24 ºC and amount of added nanocomposite: 250 mg. Results showed that in optimum experimental conditions the removal percentages are about %94 for AR88 and %71 for AO7 indicating good removal performance toward the method whilst pH-sensitivity of the nanocomposite facilitates retrieval of nanocatalyst at the end of the reaction. P.S. Harikumar, J. Litty, A. Dhanya, J. Environ. Eng. Ecol. Sci. 2 (2013) 1. E. Akceylan1, S. Erdemir, J. Incl. Phenom. Macrocycl. Chem. 82 (2015) 471. H.J. Mansoorian, E. Bazrafshan, A. Yari, M. Alizadeh, Health Scope. 3 (2014) e15507. M. Lučić, N. Milosavljević, M. Radetić, Z. Šaponjić, M. Radoičić, M. K. Krušic. Sep. Purif. Technol. 122 (2014) 206. F. Feng, Z. Xu, X. Li, W. You, Y. Zhen, J. Environ. Sci. 22 (2010) 1657. Z. He, L. Lin, S. Song, M. Xia, L. Xu, H. Ying, J. Chen, Sep. Purif. Technol. 62 (2008) 376. M. Bahram, R. Talebi, A. Naseri, S. Nouri, Chiang Mai J. Sci. 41 (2014) 1230. B.M. Kalejahi, M. Bahram, A. Naseri, S. Bahari, M. Hasani, J. Iran. Chem. Soc. 11 (2014) 241. A. Naseri, R. Barati, F. Rasoulzadeh, M. Bahram, Iran. J. Chem. Chem. Eng. 34 (2015) 51. M. Bahram, S. Asadi, G. Karimnezhad, J. Iran. Chem. Soc. 13 (2015) 639. M. Bahram, M. Hasani. S. Bahari, J. Iran. Chem. Soc. 13 (2016) 449. M. Azami, M. Bahram, S. Nouri, Curr. Chem. Lett. 2 (2013) 57. V.K. Gupta, A. Mittal, V. Gajbe, J. Mittal, Ind. Eng. Chem. Res. 45 (2006) 1446. S.T. Akar, T. Alp, D. Yilmazer, J. Chem. Technol. Biot. 88 (2013) 293. A. Fernandes, A. Morão, M. Magrinho, A. Lopes, I. Gonçalves, Dyes. Pigments. 61 (2004) 287. G. Li, J. Qu, X. Zhang, J. Ge, Water. Res. 40 (2006) 213. A. Özcan, M.A. Oturan, N. Oturan, Y. Şahin, J. Hazard. Mater. 163 (2009) 1213. A. Ozcan, M. Gençten, Chemosphere 146 (2016) 245. P. Ji, J. Zhang, F. Chen, M. Anpo, Appl. Catal. 85 (2009) 148. G. Li, K.H. Wong, X. Zhang, C. Hu, J. C. Yu, R.C.Y. Chan, P.K. Wong, Chemosphere 76 (2009) 1185. R. Yuan, S.N. Ramjaun, Z. Wang, J. Liu, J. Hazard. Mater. 196 (2011) 173. P. Muthirulann, C.N. Devi, M.M. Sundaram, Ceram. Int. 40 (2014) 5945. S. Hu, F. Zhou, L. Wang, J. Zhang, Catal. Commun. 12 (2011) 794. M.E. Olya, A. Pirkarami, M. Soleimani, M. Bahmaei, J. Environ. Manage. 121 (2013) 210. K. Balachandran, R. Venckatesh, R. Sivaraj, P. Rajiv, Spectrochim. Acta A. 128 (2014) 468. P. Sathishkumar, S. Anandan, P. Maruthamuthu, T. Swaminathan, M. Zhou, M. Ashokkumar, Colloids. Surf. A. 375 (2011) 231. P. Sathishkumar, R. Sweena, J.J. Wu, S. Anandan, Chem. Eng. J. 171 (2011) 136. C.C. Carias, J.M. Novais, S. Martins-Dias, Bioresour. Technol. 99 (2008) 243. M.D. Chengalroyen, E.R. Dabbs, World. J. Microbiol. Biotechnol. 29 (2013) 389. R.G. Saratale, G.D. Saratale, J.S. Chang, S.P. Govindwar, J. Taiwan. Inst. Chem. E. 42 (2011) 138. M.A. Rauf, S.S. Ashraf, Chem. Eng. J. 151 (2009) 10. C. Xu, L. Cao, G. Su, W. Liu, H. Liu, Y. Yu, X. Qu, J. Hazard. Mater. 176 (2010) 807. K. Vinodgopal, P.V. Kamat, Environ. Sci. Techno. 29 (1995) 841. K. Vinodgopal, I. Bedja, P.V. Kamat, Chem. Mater. 8 (1996) 2180. T. Wang, H. Wang, P. Xu, X. Zhao, Y. Liu, S. Chao, Thin Solid Films 334 (1998) 103. M.A. Behnajady, N. Modirshahla, R. Hamzavi, J. Hazard. Mater. 133 (2006) 226. C. Tian, Q. Zhang, A. Wu, M. Jiang, Z. Liang, B. Jiang, H. Fu, Chem. Commun. 48 (2012) 2858. A. Ajmal, I. Majeed, R.N. Malik, H. Idriss, M.A. Nadeem, RSC Adv. 4 (2014) 37003. I.K. Konstantinou, T.A. Albanis, Appl. Catal. B-Environ. 49 (2004) 1. M. Nikazar, K. Gholivand, K. Mahanpoor, Desalination 219 (2008) 293. S.X. Liu, X.Y. Chen, X. Chen, J. Hazard. Mater. 143 (2007) 257. Z. Sun, C. Bai, S. Zheng, X. Yang, R.L. Frost, Appl. Catal. A-Gen. 458 (2013) 103. Y. Luo, J. Liu, X. Xia, X. Li, T. Fang, S. Li, Q. Ren, J. Li, Z. Jia, Mater. Lett. 61 (2007) 2467. L. Marija, M. Nedeljko, R. Maja, Š. Zoran. R. Marija, K.K. Melina, Polym. Composite. 35 (2014) 806. J.S. Im, B.C. Bai, S.J. In, Y.S. Lee, J. Colloid. Interf. Sci. 346 (2010) 216. W. Kangwansupamonkon, W. Jitbunpot, S. Kiatkamjornwong, Polym. Degrad. Stabil. 95 (2010) 1894. S.M. Henry, M.E.H. El-Sayed, C.M. Pirie, A.S. Hoffman, P.S. Stayton, Biomacromolecules 7 (2006) 2407. J. Ryu, W.Choi, Environ. Sci. Technol. 42 (2008) 294. S. Shafaghi, P. Najafi Moghadam, A.R. Fareghi, M. M. Baradarani, J. Appl. Polym. Sci. 131 (2014) 40389. Z. Šaponjić, M. Radoičić, M.K. Krušić, Eur. Polym. J., 82 (2016) 57.